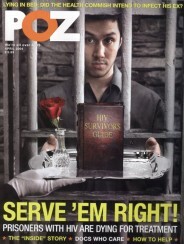 One of the “Most Talked About” stories recently on POZ.com is a brief article on a new book titled Denying AIDS: Conspiracy Theories, Pseudoscience and Human Tragedy, originally from the June 2009 issue of POZ magazine. Here is our complete interview with the book’s author, Seth Kalichman, PhD, a social psychology professor at the University of Connecticut. What inspired you to examine AIDS denialism in your book? I’d been working in South Africa for years, and I’ve been aware of this crazy stuff that was going on with the president there, former President [Thabo] Mbeki. But I pretty much ignored it because we’re not going to change the president and, you know, we just have to do our work with preventing and getting treatment to people. Like most AIDS scientists, I really ignored it even when it was in my face for quite some time. But about a year and a half ago, I came across some work from Nicoli Nattrass, who really laid out the depth of denialism and its impact on what is going on in South Africa. The way she laid it out was extremely difficult to ignore the number of people that have been essentially held back from getting treated, the number of people that had died, the number of veritable HIV infections that had happened, really, senselessly, because the president believes HIV may not cause AIDS and that antiretrovirals are poison. So the South Africa situation was glaring at that point. And then the other thing that happened was I serendipitously stumbled upon someone here in the northeast in New York. I learned that a psychologist whose work I was very familiar with, who was trained by some of the best social scientists in the world, is an AIDS denialist. That she really believes that HIV may not cause AIDS, that [noted AIDS denialist] Peter Duesberg has not been given his due and that he, in fact, may very well be right—that HIV is harmless and that AIDS is really the result of drug abuse and antiretroviral therapy. And I was totally blown away by this. It just absolutely enraged me. And my anger surprised me. Why would this make me so angry? And I started to look at it, and I was able to connect her denialism with the South Africa situation. I thought that this was something worth studying, and that our denialism problem needs a careful look like Nicoli Nattrass had given the South Africa denialism problem. And I was not surprised that no one had ever done that. Denialism has been completely ignored; it has been completely under researchers’ radar screen, and I think part of that is because scientists have believed that if you ignore them, they’ll go away. And, in fact, they’ve just really strengthened. What do you make of the recent and apparently AIDS-related death of well-known AIDS denialist Christine Maggiore? We know that her life was worsened because of her denialism. And we know that because of the success of antiretroviral therapy for most people, she probably could have had a longer, healthier life. But my feeling is that this woman is both a victim and a perpetrator. And it’s very difficult to sort those feelings out. Both the suffering that she went through and the suffering she caused. But it’s come to that, where people have actually requested the death certificate of this person from California and posted it online. Which is actually fairly obscene. But it’s really come to that. If you talk to people who believe that there’s a scientific debate that HIV may not cause AIDS and that antiretroviral therapy is toxic poison, it’s hard for them. They have about a gazillion reasons why Christine Maggiore died that have nothing to do with her HIV infection. And it is that level of denialism where any little hole is made into this big opening for questioning the science of medicine of HIV. It’s driven AIDS scientists to such extremes as digging up death certificates and posting them online. I think it’s a real testament to how bad this is. What is very clear among these people is that they believe she actually died of stress, that she was actually killed by people like me who questioned her convictions, who kept bringing up the [AIDS-related] death of her daughter—the real tragedy of her life. And it was really that stress that did her in. And they really believe that. Here’s a woman who tested HIV positive in 1992, and we can now see [on] her death certificate that she died of AIDS. The pneumonia was actually secondary. The primary diagnosis was disseminated herpes infection, which you really don’t see in anyone except people who have very depleted CD4 cell counts. It’s really a very specific opportunistic infection. Some of these denialists are so intractable that it just doesn’t matter. They’re not really the target of the book Denying AIDS. And I don’t think that [they are the] target of the education programs of people like Martin Delaney and John Mohr, people who are really trying to do something about denialism. Their real targets and my real targets are those people, for example, who just test HIV positive and get online looking for answers and stumble upon this stuff. And what do you think draws people to AIDS denialism? I think that there’s comfort for some; I think that there’s fascination or anger for others. This is not a monolithic group. It’s a very diverse group. Some people are drawn to AIDS denialism out of their own psychological issues that they’re dealing with. Like the person who has recently tested positive and can’t accept it. Or someone in their life has. Or the person who wants to get tested but wants a reason not to. But there’s a big audience in this among the antigovernment, antiestablishment types. And they’re into everything. And there are others who really ascribe to homeopathy and alternative treatments. A lot of them, not all of them, are also gravitating toward the AIDS denialists because the AIDS denialists have used that as a hook—that AIDS should be treated naturally because the causes are natural. Like stress. So that’s a big part of the audience. But what I wouldn’t want to say is that people who are into alternative treatments are denialists. Most denialists, though, do push alternative treatments. Would you say some of it also stems from distrust of pharmaceutical companies? Absolutely. And that’s sort of the conspiracy-theory minded people, whom I call in the book “suspicious thinkers.” The suspicious minds. And some of the denialists, the people who are really propagating this, are very clearly paranoid. But I don’t think that the people who get online, read this stuff, buy the books and are sort of hooked into it are necessarily paranoid. But a lot of them are definitely suspicious people. They’re suspicious of government, suspicious of science and medicine and big pharma. And they do see a conspiracy. And it’s remarkable to me, how many of those people there are. In the book you compare AIDS denialism to a beehive. Could you explain that? What I was trying to convey is that if you take a look at all the different denialist websites and the blogs and the magazine articles, a lot of it looks fairly chaotic from a distance. You’ve got people saying HIV doesn’t even exist and no one can prove it. Then you’ve got Peter Duesberg who’s saying HIV does exist but it’s harmless. Then you’ve got other people who say HIV isn’t harmless, but it’s not sexually transmitted. And from a distance it looks like it’s a very uncoordinated, sort of swarm. Like a beehive does from a distance. But as you get closer, you see that it’s very well organized. And actually there is a centralized group, and it is the Rethinking AIDS group. And there are three or four people who are very involved in that. To write this book I actually went undercover. I never misrepresented myself. I posed as a student of public health, which of course I am. But I had to be able to talk to these guys without barriers. I wanted to get to know what was really going on with them. And as I did that, I saw they’re very well connected with each other. In fact, there’s a vetting process that I went through to be listed as an AIDS dissident on the Rethinking AIDS website. Christine Maggiore herself vetted me, and I was posted. And once I was listed on there, the door was open to me. They would all talk to me. And it was actually very well organized. And, in that way, like a beehive. And the other part of the swarm thing is, I do expect to get stung by this. The hate mail has already started. The online assault has started—which I fully expect. For the book to be successful, they’ve got to come after me. If they don’t then I think the book was probably a waste of time. I hope there’s a couple things that they take away. One thing I hope they take away is that they can’t believe everything they read online and in books. They really need to think critically about the information that they’re getting; they need to think hard about the doctor they are seeing and be really good consumers of health care. Not to be close-minded, but be critically thinking. If a new idea comes out or if they hear something different that their doctor didn’t tell them, they should listen and attend to it. One thing I really hope that folks with HIV will look at carefully is the credibility of who’s saying what they’re listening to. Not the credentials, but the credibility. You have professors saying HIV doesn’t cause AIDS and that you don’t have to worry about it. And those same professors say that the Loch Ness Monster exists. That should mean something. 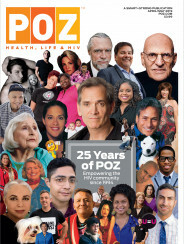 That’s something that I’d hope the readers of POZ walk away with. That they really have a role in combating this misinformation. They have a role to become informed and to not be silent when they see misinformation. If they see something on a blog that they know to be garbage, comment on it. People who are buying into it are very vocal and very visible. And everyone else is ignoring them. So it looks like everybody’s buying into this. All royalties from Denying AIDS will help the Family Treatment Fund provide antiretroviral medication for people living with HIV/AIDS in Africa.